Embodying Punishment: Emotions, Identities and Lived Experiences in Women’s Prisons, Anastasia Chamberlen, Clarendon Studies in Criminology Series, Oxford University Press. 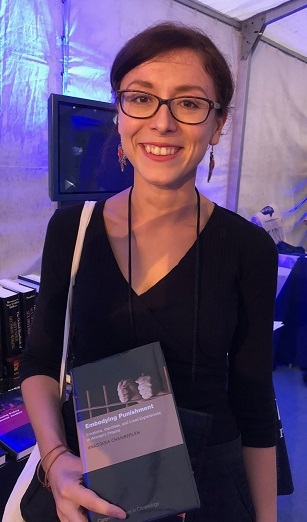 At a time when prisons in England and Wales are undergoing significant challenges, and when levels of harm remain unprecedently high, this new book by Dr Anastasia Chamberlen, Assistant Professor at the Department of Sociology, University of Warwick, offers a comprehensive, feminist critique of punishment that looks at an often unseen population – women prisoners and women former prisoners. Using empirical research based on interviews with women who have experienced prison, Dr Chamberlen (pictured, right) investigates the embodied experience and the emotions of punishment today and responds to a call for a more affective sociology of imprisonment in the field of prisons research. Dr Chamberlen said: “At its core, my book emphasises the importance of acknowledging the centrality of the prisoner’s body in experiencing, feeling, adjusting to, coping with, and surviving prison and life after prison. Drawing on a feminist phenomenological framework informed by an engagement with scholars such as Maurice Merleau-Ponty, Simone de Beauvoir, Erwin Goffman, Michel Foucault, Sandra Lee Bartky and Tori Moi, Embodying Punishment revisits and expands the literature on the ‘pains of imprisonment’, and offers an interdisciplinary examination of the embodiment and identities of prisoners and former prisoners, pressing the need for a body-aware approach to criminology and penology. Among the research themes Dr Chamberlen discusses are women’s perception of the prison through time, space, smells and sounds; the experience of change on prisoner bodies; the presentation of self in and after prison, including the centrality of appearance and prison dress in the management of prisoner and ex-prisoner identities; and a range of coping strategies adopted during and after imprisonment, including consuming prison food and drug misuse. The book also includes a case study on women's self-injuring practices. The book draws on fieldwork conducted as part of Dr Chamberlen's doctoral research, which was funded by the Graduate School at King’s College London.